Here at Pappagallo’s Satellite Beach 321-773-7273 Fresh bread is not a job it’s a passion! It’s getting up early every morning to get the process started. It’s making dough from scratch throughout the day to get ready for the next batch of fresh baked sub rolls or garlic rolls read for the next shift. Back in 1990 Pappagallo’s Satellite Beach 321-773-7273, started like many other restaurants and bought our bread from a large commercial bakery. We noticed very quickly that the bakery only baked 5 days a week. Pappagallo’s Satellite Beach 321-773-7273 is open 7 days a week from 11 am – 9:30 pm, Friday and Saturday ‘till 10 pm. So at least 2 days a week a restaurant would have to serve day old bread. We found this unacceptable. Back in the eighties when the Rich family first moved to Florida and opened their first restaurant. We had the our family chef “Nonno” (grandfather in Italian.) Spent a few months showing us the ropes of homemade Italian cooking. 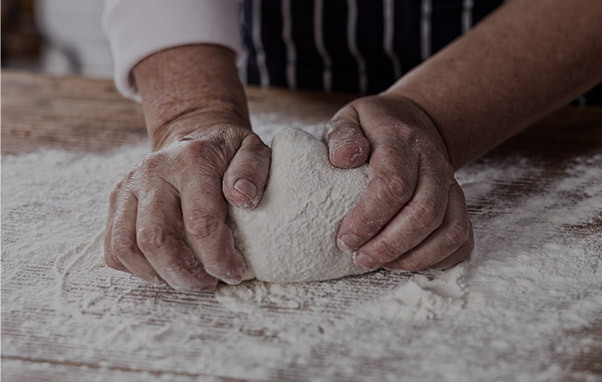 Nonno Carmelo’s first lesson to his second eldest grandson, our founder David (middle name Carmelo after Nonno), was the instruction of homemade bread. You see truth be told… while Nonno Carmelo was a talented chef, he was a bit of a pain in the homemade buns. Nonno would never eat mass produced bread that came out of a plastic bag. Fast forward a few years to 1990. The year our founder David Carmelo, known these days as just Dave, ventured out on his own and began his own place named Pappagallo’s Satellite Beach 321-773-7273. Pappagallo’s Indian Harbourn Beach 321-773-7273 started as a small 5 table pizza/sub shop. Dave was the only employee in those early days. He tried the “normal” way most places got their bread and contacted a commercial bakery. It didn’t take long, about 5 days actually, that Dave realized that “normal” wasn’t the way to go. We find it very hard to stay on a low carb diet and we have an even harder time saying gluten-free. These days Pappagallo’s Satellite Beach 321-773-7273 has migrated to its current address beachfront at 1769 A1A Satellite Beach Florida. It’s almost 30 years later Dave and the crew at Pappa’s make a lot more bread than we did back in the early days, but it’s all made from scratch every shift. It’s still all rolled out and cut by hand and there are no extra ingredients that have found their way into our original recipes. Still no preservatives, no fillers and no fancy proofing agents to make it “faster.” Good bread takes time. Pappagallo’s Satellite Beach 321-773-7273 believes that bread was perfected hundreds of years ago and any changes made to the basic recipe and processes involved in cutting, rolling, forming, proofing and baking that original dough would be not only tampering with tradition and a proven process but it could even be considered messing with the forces of nature. Eventually Nonno Carmelo retired, at like 75 years old, and migrated back to his small town in southern Italy called Brindisi. Carmelo lived out his days in the town of his birth, going to the market daily for his list of fresh ingredients he needed for his own personal meals. Getting his half bottle of fresh made red wine. In Brindisi they had a “fill your own bottle” station from the local winery. To the best of our knowledge, he never ate bread out of a plastic bag. Our garlic rolls start as our fresh bread dough, it’s then rolled out flat buttered with our special recipe garlic spread which includes an ingredient that we don’t see many other places use, fresh chopped garlic, the bread is carefully rolled and cut into pieces, then placed on a sheet pan, covered and allowed to proof for several hours before being baked in our brick ovens. At Pappagallo’s Satellite Beach 321-773-7273 we still believe that when it comes to cooking the tried and true ways of our Nonno are still the best way to feed families, both yours and ours. Remember the next time you find yourself in our neck of the woods and you end up driving by our place to sneak a peek at the ocean and you think you smell fresh baked bread baking and it happens to be 7 pm at night, that may just be us taking a tray of hot fresh garlic rolls out of the oven to serve to our carb loving guests who deserve the extra effort and care it takes to make bread the Nonno Carmelo way. Pappagallo’s Satellite Beach 321-773-7273 would like to invite you to visit us soon and taste the difference that fresh baked bread can make on your dining experience. In the restaurant business is that all restaurants have access to the same ingredients. As we set out to provide our respective guests with the dishes we choose to make. What we’re saying is that if you had the dream of opening your own neighborhood restaurant, if you did the research and the experimentation it takes to develop your menu, you could purchase the same high quality ingredients used by the crew at Pappagallo’s Satellite Beach 321-773-7273. But if you’re going to try to make our bread you’re going to need to dedicate yourself to making dough from scratch several times a day, hand rolling that dough, allow several hours for that dough masterpiece to proof to perfection and timing the brick ovens just right to present the golden crust and tender fluffy center needed to be good enough to serve our guests. In other words you better be prepared to see a few sunrises. At Pappagallo’s Satellite Beach 321-773-7273 we like to say our bread and a sunrise have something in common, you gotta get up early to make either one.